With over 4 million mobile apps available to both iPhone and Android users, it’s safe to say that if you’re interested in getting into mobile phone app development, you’re going to have some serious competition. However, if you’ve got an awesome idea for an app and a competitive spirit, there’s no reason why you can’t succeed. After all, the average consumer uses about nine apps every day, and app revenue is at an all-time high. So, chances are that there is someone out there who is already excited about what you have to offer. You don’t actually know anything about mobile phone app development. Don’t give up on your dream before you give it a try. Instead, read this complete beginner’s guide to building your first ever app. 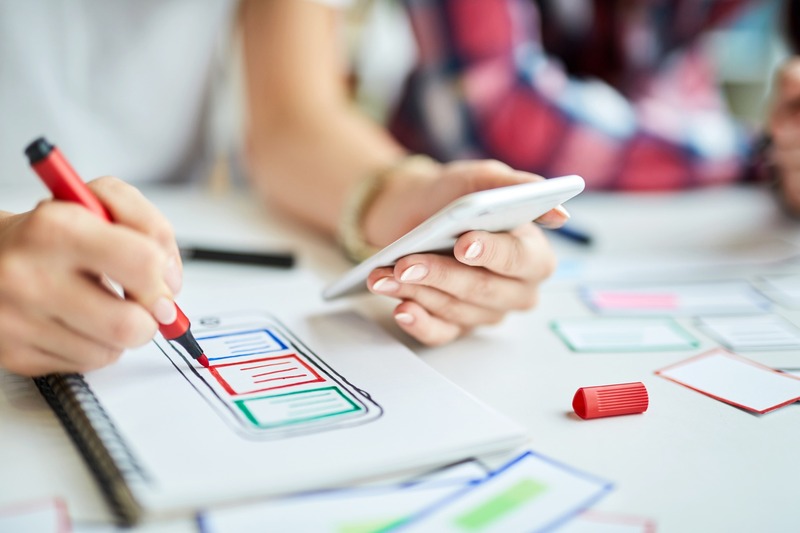 Before you get into the design and deployment phases of mobile phone app development, you need to brainstorm exactly what your app will do and who it will help. You might already have some more basic ideas in mind — but now, it’s time to seriously flesh them out. Ask yourself which specific problems your app is going to solve, as well as the type of app you plan to create. For example, are you more interested in developing an e-commerce app? Additionally, be sure you’re clear on how your app is markedly different from the other ones out there. No one wants to download a lesser version of a more popular app. Next, start sketching the actual layout of the app itself. How will users move through your app? How will they make purchases? What kinds of notifications will you send to your users? What will the interface of your app look like, and will it be available both online and offline? These are the kinds of details that you need to start thinking about — and be prepared for lots of trial and error during this phase. It’s time to start actually creating and designing your app. If you have the technical prowess, you may be able to do this on your own. Chances are, however, that you’ll need to work with an experienced app developer. Together, you’ll create an app prototype that can then be released in beta form. This will allow you to test and refine the app before you actually release it to a wider market. You’ll also need to actually register yourself as an app developer. This will ensure that your app is actually compatible with the types of devices and services that you plan on using. It will also help you to select the correct programming language, such as Java, C++, or Python, among others. Now that you have clear goals and an even clearer design, it’s time to bring your app out into the real world! However, you need to understand that mobile phone app development is not something you can just release into the wild and then walk away from. You need to constantly monitor both the download rate and the overall functionality of your app. You need to send your app out to a testing platform that will check your app for bugs, evaluate its security, and ensure that it actually works the way it’s supposed to. Once your app has made its way to the app store, it’s time to focus on your marketing efforts. In other words, how are you going to make sure that people actually download your app? You could start by connecting with app reviewers and asking them to write a post about your app. You could also offer free trial periods to users, or even a percentage off of the usual price. Additionally, you need to make sure that you’ve written a clear description of what the app actually does. Keep it short, sweet, and relevant — nobody comes to the app store to read a lengthy paragraph about how your app is going to change the world. Be concise, make it clear who your target market is, and move on. Then, make sure that you start immediately developing upgrades for your app. This will help to fix bugs and improve the overall user experience. Not sure you can handle the updates/upgrades on your own? Need More Help With Mobile Phone App Development? Thanks to this handy guide, you have a general idea of what it takes to build your first ever mobile app. However, we find that many people — yes, even you — still get tripped up when it comes to the more technical side of mobile phone app development. You don’t want your awesome idea to go to waste just because you have a lack of technical skill. And when you see someone else successfully create an app that’s similar to your own, you’re going to kick yourself for not doing everything you could to make it happen. Spend some time on our website and blog to learn more about the app development services we offer, and the ones we’ve already helped to create. Then, fill out the form below to get in touch with us to bring your app to life and rake in the profits.